Developed new CAAP application for an agronomic project looking at naturally occurring bio-products for pest control in organic agriculture. Provided research and an interview for upcoming Better Farming article on local foods and sustainability. Disseminated New Directions and TPA research data to OCO members. Met with OCO member and advisor Gillian Flies of the New Farm to strategize our consumer outreach campaign. Met with Harmony Dairy to discuss our Broader Public Sector Investment Fund pilot project to increase availability and promote organic at select universities. Collaborated with OCO member FarmStart to initiate a meeting to plan a Social Finance in Farming Forum for spring 2013. Developed programming for EcoFarm Day 2013 in partnership with OCO member EFO featuring Richard Wiswall. 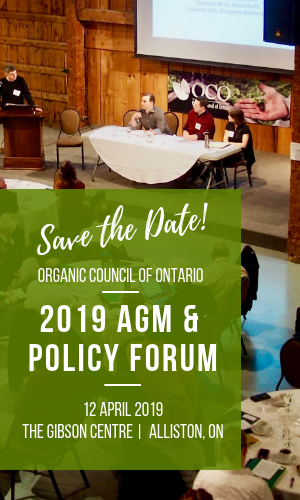 Attended business forum “Natural/Organic/Local – Be careful what you ask for.” hosted by the University of Guelph’s Ontario Agriculture College & College of Management Economics to learn about food industry initiatives.